Mad4You Hostel Presents…. Its events! Have you already heard about the event we, at Mad4You Hostel organize? If not, come closer and read carefully! This month we want to introduce you to all the events that we organize daily/weekly for our loved guests. And what better way to write our monthly blog about them? We all know that whether you are a solo traveler or traveling with a group of friends, it is always a good idea to mingle and learn about other cultures and languages. Our one and only famous courtyard is the perfect place for socializing. Next to that, we do our best to help you to meet new people and make new friends, by organizing different events. Keep reading and find our what is going on at Mad4You Hostel! Mad4You Hostel is located on a quiet street in the center of the modern neighborhood of Malasaña, Madrid city center. This neighborhood is often compared to Camden Town in London, the East Village in New Work, Kreuzberg in Berlin and Barrio Alto in Lisbon. Every day, at 6pm, we organize a one-hour free walking tour of Malasaña, during which we share all the lovely stories about the area. From interesting historical facts to where to have the best drink and from where to shop vintage clothes to where to eat the best Spanish tortilla. Stroll around Plaza Dos de Mayo and learn about the area when Napoleon was invading Madrid. Visit Calle del Pez and find out why this street is called Street of Fish. Walk pass the bar where you can drink traditional yayo´s. And who said there is no beach in Madrid? We will show you where to find the restaurant that has a floor completely covered in sand. The best place to enjoy a cocktail and thank us later! The guide for the Malasaña walking tour will be waiting for you at the reception and it is not necessary to sign up in advance. Do not miss this tour and explore the most hipster neighborhood of Madrid with us. Did you just arrive in Madrid and do not know where to start or what to see? The cool guides of Madride Travel are the best to show you around the historical city center of Madrid. Every morning at 10:30 a guide comes to the reception of Mad4You Hostel to pick up all guests interested in joining the tour, which takes around 3 hours. All important places are covered during the tour, such as Puerta del Sol, which is the heart of Madrid city center, Plaza Mayor, the Royal Palace and many more interesting sights. The information told is very interesting. For example, can you explain the difference between the position of the legs of each horse statue? We do! If you join the tour you will also find out. The tour is available in two languages: English and Spanish. So according to your preference you can join either one. As the name already says, the free walking tour is completely free of charge, although you are always welcome to tip the guide at the end of the tour depending on how much you enjoyed it. Were you not able make it at 10:30? There is no need to worry! There is another late-afternoon tour every day, which starts at 5pm and takes approximately 2,5 hours. Please note that the morning and evening tours have different routes, so you might want to join both! The meeting point for the 5pm free walking tour is in front of the bear statue (El Oso) at the Puerta del Sol square. Ask our receptionists how to get there, they will gladly explain you how to walk the 15-minute route to the meeting point. At Mad4You Hostel our patio always steals the show! 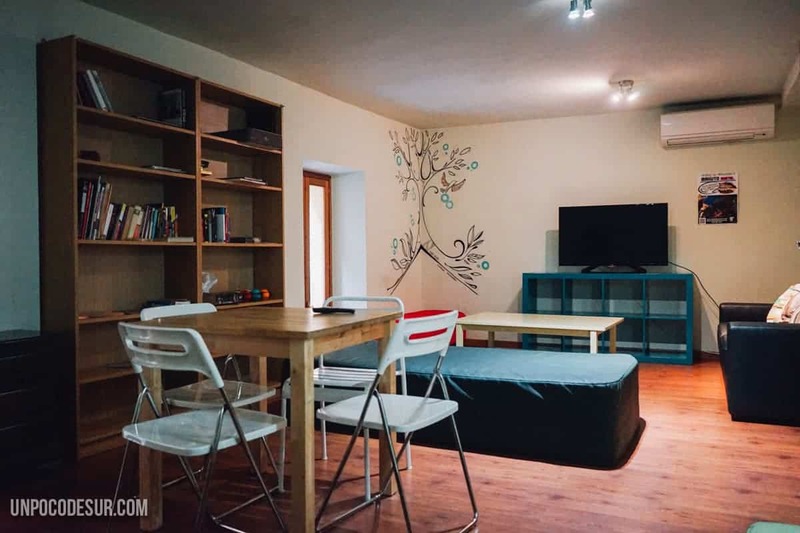 But we also have a common room with a TV, couches to chill on, books that you can exchange and table games in case you get bored. The movies we are showing are, for example, Amelie, Moulin Rouge, 50 First Dates, Home Alone and the documentary of Amanda Know. Every Sunday at 7pm we turn our common room into a small cinema. Fancy a Sunday afternoon/evening in complete relax-mode? Prepare the popcorn and drinks and meet us at the common room! At Mad4You Hostel, it is not all about walking tours and movie afternoons. We know how to have fun very well! We all know that you cannot leave Madrid without trying some typical Spanish sangria! That is why every Thursday, Friday and Saturday at 9pm one of the cool guides from Madride Travel visits the hostel to serve our guests some free sangria. You will be able to play some drinking games, like sangria-pong (instead of beer-pong). On Thursdays the guide will show you how to make your own Sangria, which you will, of course, also try. So, do not be shy! Yes, we are talking to you solo traveler! Last but not least… We would like to talk about one of our most-famous events: the Pubcrawl! The Pubcrawl with Madride Travel is the best way to explore the nightlife of Madrid, visiting the most popular- and fun bars and nightclubs with a bunch of fellow party people from all around the world! It is only 10€ and includes the entrance fees to all bars and clubs. You will also get a free shot in every bar and special offers and discount on the regular drinks. One offer that we love is the one of paying 6€ at the first bar so you will be able to join an open-bar of sangria or beer for a whole hour! Fun (and hangover) guaranteed! The pubcrawl starts every night at 10:30pm at the bear statue, at Puerta del Sol. Just holler at the reception if you need some directions on how to get there. A very important detail for you to know: the first night you join the pub crawl you pay 10€, if you join for a second time you only pay 5€ and if you decide to join for third time you will go on the crawl for free and you will receive a VIP-card, which allows you to join the Madride Travel pub crawl for free for life. Woohoo! This blog is coming to an end and we are hoping you enjoyed reading our post and would like to visit us so that you can join all our fun events. Please, do not forget that for anything you might need in Madrid or any questions you have about our hostel, you can always contact us writing to info@mad4youhostel.com or ring us at 0034915217549. We are more than happy to help with whatever you might need. And please follow us on Instagram @mad4youhostel or on Facebook: Mad4You Hostel to see all our funny posts about the hostel and things happening in Madrid.